Stretch out your body – try a little light yoga after waking up in the morning. I enjoy a simple “Sun Salutation” (I learned it on the Nintendo Wii!). Stretch out your mind – make time for reading every day. Fiction or nonfiction, it doesn’t matter. Stretch out your soul – find a way to be creative every day. For me, I try to sit down for fifteen minutes each day to play and write at the piano. Stretch out your heart – when interacting with other people, lead with love. Imagine the best in them. It may seem like you’re leaving yourself open and vulnerable, but take the chance. It can expand your everyday relationships to something more meaningful and powerful. As we age, our default becomes cynicism and skepticism. Fight it! Read a chapter – Right now I’m reading “A Romance on Three Legs: Glenn Gould’s Obsessive Quest for the Perfect Piano” by Katie Hafner. Quietly sit – Go to a park and absorb some nature. Go to a coffee shop and absorb some commotion. Feed your senses. Listen to a “brand new music” playlist – All of the streaming music services have a collection of cutting edge releases. Check them out! Light a spark. Set your creativity ablaze! Map out a dream you’d like to have. The practice is good for your soul. Ah, what a tune! Here’s another DM song for ya (maybe a bit more recognizable!). Thanks for taking that trip with me down Depeche Mode Boulevard! Are you a fan, too? What’s your faorite DM tune? Sometimes an audience isn’t even close to giving you the energy you are craving (or needing) for your show. It doesn’t matter why–so many factors can play into it: small audience size, too far away from you, sports on the TV, networking events, et cetera, et cetera, ad nauseam [latin!]. It can be so crazy frustrating to play in these situations, but–here’s the thing–you can’t let it get to you. Keep pushing that rope. Keep banging your head against that wall. Keep herding those cats. You gotta do it, because there’s going to be a moment when something shifts, and the folks will be more receptive to what you’re doing. If you’re not there 100% to capitalize on that instant, it will pass you by. Don’t let it! It’s going to be tough–it’s going to be damned near impossible–but you can’t give up on that crowd. They’re going to be there for you. Where will you be? When playing a request-based show, sometimes you are faced with a conundrum – you just don’t have any requests to play! This happens a lot of times at the beginning of a show while people are still getting situated, their drinks ordered, etc. Sometimes it can happen during a longer show if the crowd is in the middle of a turnover. Hell, sometimes the crowd just wants to sit back and listen without having to constantly think of another clever tune. Well, what do you play? It’s easy to panic and not be able to think of even ONE of the hundreds (maybe thousands) of songs you know you can play at that moment. That is where the “go-list” comes in handy. The go-list is simply a list of songs that you know can work at any time. These lists are also useful when you’d like to change the direction the requests have been going. For instance, when a lot of people come to a piano-bar show, they limit themselves to only thinking of “typical piano songs” (Elton John, Billy Joel, Rat Pack, etc.). They don’t realize that we can play guitar-heavy songs, too. It’s times like these when a well-placed rocker by the Stones or even some Def Leppard can step up the request game. The go-list is a great way to remind yourself of that perfect song. There are countless ways of putting your go-list together. You can jot down a list on the back of a request slip before the show starts. Some folks use a Post-It note. I prefer a spreadsheet on Google Drive that I can access at any time from my phone or my tablet [nerd alert]. 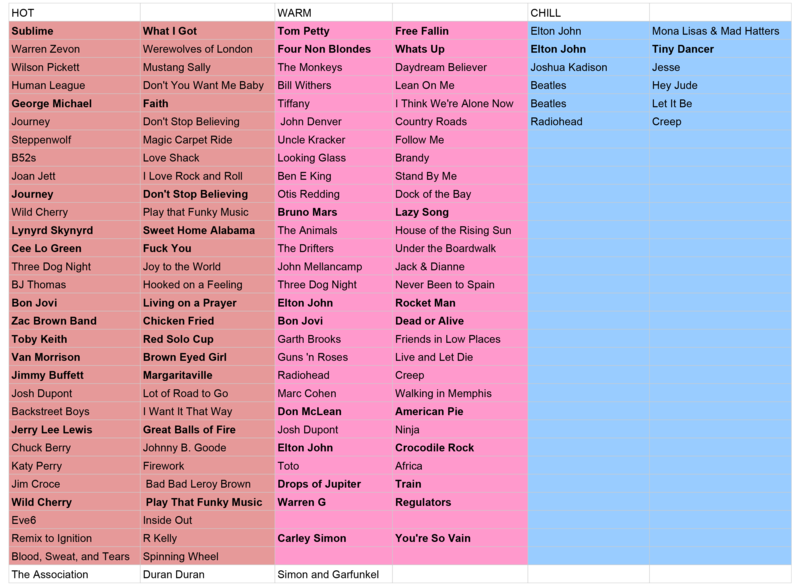 I maintain a couple of them – one dance-heavy list for wedding receptions and another one for solo shows that I have separated into three categories based on the pacing of the show (low, mid, and high energy). The go-list is a great tool to keep up your sleeve. You never know when you’ll need it. Keep it updated and keep it handy.